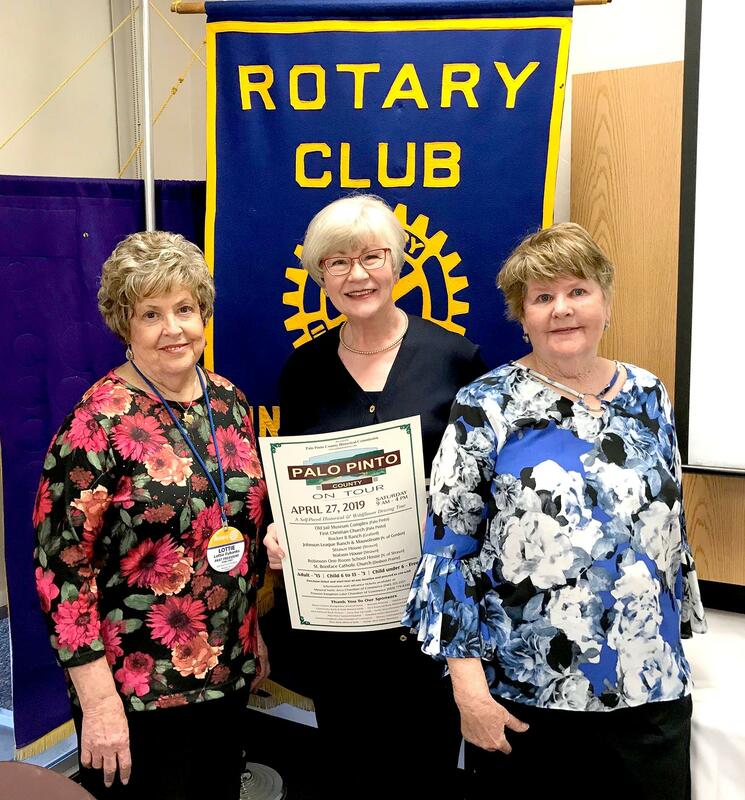 Palo Pinto County Historical Commission members Pam McCreary and Sandra Crawford on Wednesday gave Mineral Wells Rotarians a sneak peak of this year's Palo Pinto County on Tour event. Held every two years, this year's tour is set for Saturday, April 27. McCreary, pictured right, and Crawford, center, were special guests and speakers for this week's Rotary Club of Mineral Wells meeting, invited by program chair and PPCHC member Lottie Eubanks. The event is a self-paced historical and wildflower driving tour. It can be started – and tickets purchased at – at any of the 2019 tour destinations. • Rocker B Ranch off State Highway 254 between Graford and Possum Kingdom. • First Christian Church in Palo Pinto. • The Old Jail Museum Complex in Palo Pinto. • St. Boniface Catholic Church on Dodson Prairie Road west of Palo Pinto. • Robinson School on State Highway 16 near Strawn. • The Watson House in Strawn. • Johnson League Ranch and Mausoleum on FM Road 919. Tickets are $15 per adult and $5 for children, ages 6-15. The tour is open from 9 a.m. until 4 p.m. and you may start your tour at any of the eight locations. A tour map is provided with ticket purchase. Advance tickets are available at the Mineral Wells Area Chamber Office, the Possum Kingdom Lake Chamber Office and The Old Jail Museum Complex in Palo Pinto. 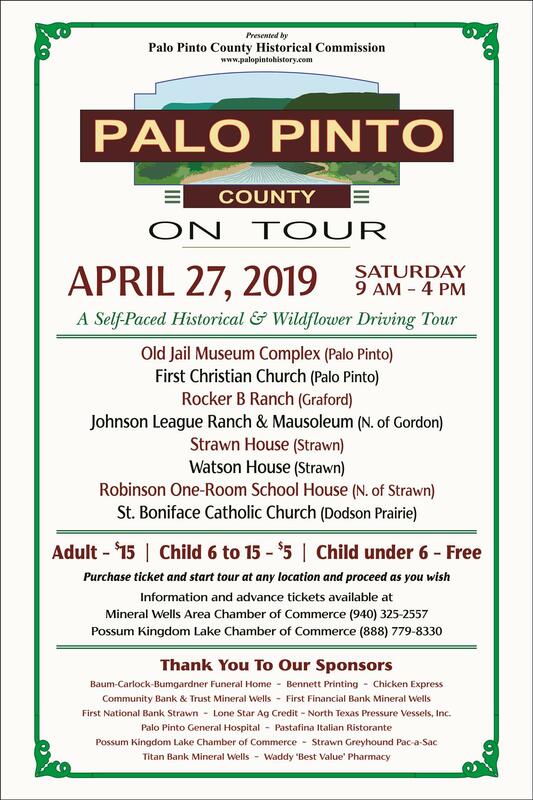 For more information about the history of Palo Pinto County and this year’s tour visit www.palopintohistory.com. Sponsors for this year's year tour are Baum-Carlock-Bumgardner Funeral Home, Bennett Printing, Chicken Express, Community Bank and Trust Mineral Wells, First Financial Bank Mineral Wells, First National Bank Strawn, Lone Star Ag Credit, North Texas Pressure Vessels, Inc., Palo Pinto General Hospital, Pastafina Italian Ristorante, Possum Kingdom Lake Chamber of Commerce, Strawn Greyhound Pac-a-Sac, Titan Bank Mineral Wells and Waddy ‘Best Value’ Pharmacy. Rotary Club of Mineral Wells meets every Wednesday at noon at Palo Pinto General Hospital for lunch, networking, updates on club events and projects and a program of interest. Meetings are for club members, invited guests and prospective members.